The pavement cafes, the architecture, the Parisian ‘hospitality’ – we must be in the French capital city. 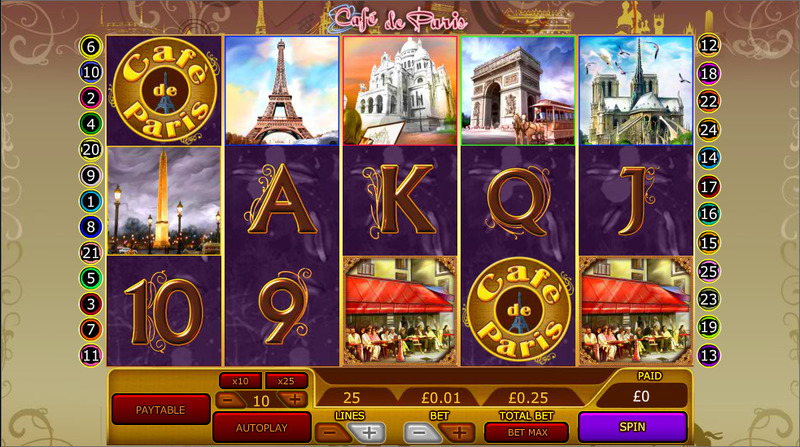 Cafe de Paris is a stylish online slot from Random Logic which takes us back to turn-of-the-century Paris and treats us to a range of famous landmarks from the City if Light. Coincidentally the Cafe de Paris is one of Monte Carlo’s most famous casinos but there doesn’t seem to be a connection with this slot. 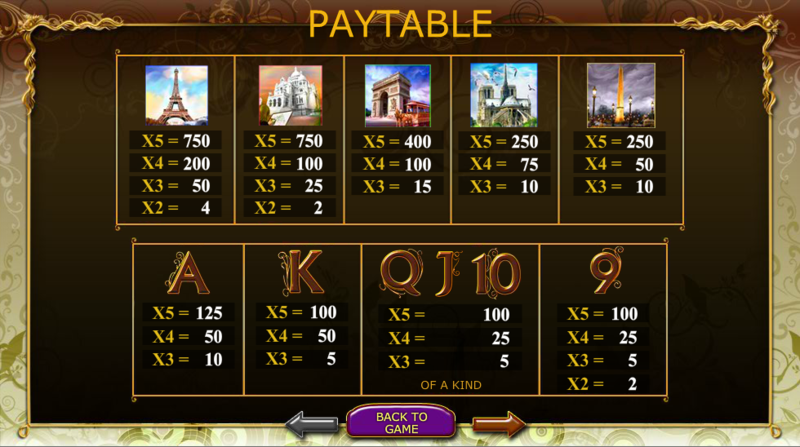 With five reels and twenty five paylines, this slot oozes Parisian culture and even the less valuable symbols – 9, 10, J, Q, K and A – feature those stylistic curls reminiscent of this era. The main symbols are the Eiffel Tower, the Sacre Coeur at Montmartre, the Arc de Triomphe, Notre Dame and the Place de la Concorde. The Cafe de Paris logo is the wild symbol and the lovely pavement cafe scene is the scatter symbol which will trigger the bonus feature. The cafe’s logo is not just a wild symbol which substitutes for other symbols, it will also multiply any wins by 3x if it contributes to a winning payline. This happens in the base game and also in the free spins round. Three of more of the pavement cafe scatter symbols landing anywhere on the reels will trigger this free spins round, as well as winning a prize for the matching symbols. You will now receive an impressive fifteen free spins and each win you land will be subject to a 3x multiplier. If a wild symbol is included in the winning line the prize amount will be multiplied by 3 twice. During this round it’s also possible to trigger more spins by landing three more scatter symbols. We recommend playing with maximum paylines to give yourself the best chance of triggering the free spins; a low starting stake of £0.01 per payline means it won’t cost you too much. This would be a fairly run-of-the-mill slot were it not for the beautiful artwork and French accordion music which accompanies your gameplay. The 9000x jackpot amount also makes it tempting for those looking for a big payout.